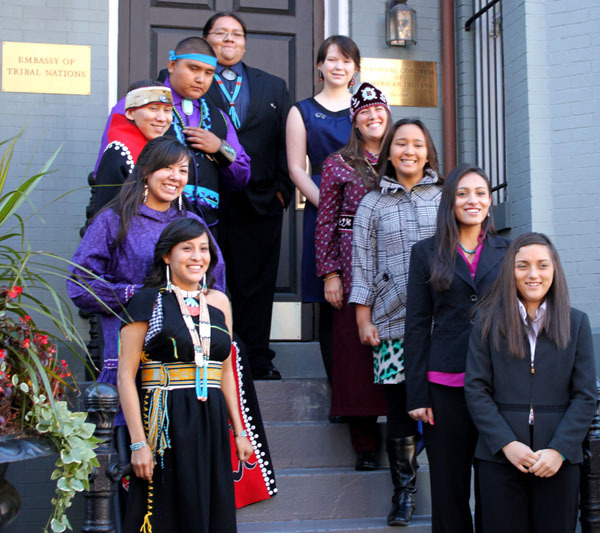 Champions of Change at the Embassy of Tribal Nations in Washington, D.C.
Teressa Baldwin: Native Village of Kiana, LeVon Thomas: Navajo, Madeline Sayet: Mohegan, Desiree Vea: Native Hawaiian, Iko’tsimiskimaki “Ekoo” Beck: Blackfeet, Emmet Yepa: Jemez Pueblo, Lorna Her Many Horses: Rosebud, Tiffany Calabaza: Kewa (Santo Domingo Pueblo), Cassandra Steele: Pomo, and Dallas Duplessis: Alaskan Native. I was selected as one of the Champions of Change for my family’s efforts to raise awareness and understanding of FASD. I’m a member of the “Self-Advocates with FASD in Action” network, run by The Arc and the Substance Abuse and Mental Health Services Administration FASD Center for Excellence. I and the other Champions were brought to Washington, D.C. to be honored for our work and to gain a better understanding of the many ways of leadership. December 1st, the Champions of Change were taken to the Eisenhower Executive Office Building and organized into discussion panels to present our causes to Tribal Leaders and U.S. Government Officials alike. After the panels were completed, we were taken to the West Wing of the White House for a Twitter Question & Answer session. The day was wrapped up with a bus tour of D.C. and a reception, and the events ended after 8 in the evening. December 2nd, however, was the big day. This day started early in the morning with a trip to the Department of the Interior, to participate in the opening and closing session of the Tribal Leaders Conference put on by the White House. Not only did we get to listen to current legislation and laws that positively affect Tribal Nations and have a basic overview of discussions between the U.S. Government and Tribal Nations, the Champions were able to meet, shake the hand of or hug and take a picture with The President of the United States. Waiting was the hardest part; time seemed to come to a standstill, as time passed, our anticipation grew. But the in the end it was worth the wait. To add to the excitement, President Obama mentioned 3 of the 11 champions in his address to the Tribal Leaders. To sum up this experience in a few short paragraphs is next to impossible, but in closing I have to say this trip was a wonderful opportunity to grow as a youth leader as well as meet other young people that share a common goal. I wish the best of luck to the other Champions in all of their endeavors. I would like to thank everyone who has helped and supported all of us as we fight to bring about change. We, as indigenous youth, are riding the winds of change, and we are knocking at your door, but who is willing to answer? This entry was posted in From the Frontlines and tagged FASD, Fetal Alcohol Spectrum Disorder, The White House. Bookmark the permalink.